David led his horse up the mountain pass, the jagged peaks of the Shandorian border towering high above him, tinged with gold in the morning light. The path had finally grown too steep for riding, and the air was thin enough here among the last twisted, wind-blown trees that David had to pause to catch his breath. He didn’t mind; he used the rest to admire his surroundings. Mountains. He had forgotten, living so long in Logansburg, how expansive, how simultaneously empty and alive they were. The breeze blew bright and cool, but the sun was warm on the top of David’s head, on his shoulders. He drank from his waterskin, and turned to look back over the path he’d been riding, winding back down into foothills and pine forest. No sign of any habitation; he’d left the last Arienish village behind yesterday, and camped last night under the summer constellations in all their glory. The weather had held clear, thank the One. He knew his delight would dampen along with the weather if he had to camp in the rain without a tent. It had been years since he’d been on a hunting trip, and he was sure his ability to build a shelter or light a cook-fire had gone rusty. The path cut between two towering stones. David led his horse into their still, cold shadow, then out into the sunlight at the crest of the pass. The west wind came slicing up the mountain-side to greet him, bringing with it the warm, familiar smells of the land that opened before him, a green land of forests and speckled meadows, with the glint of sun on water far in the distance. To his left, to the south, the hills rolled and tumbled down into farmlands, dark brown soil and young fields sprouting pale green; to his right the mountains of Shandor rose like the mossy heads of old, sleeping giants, green as all the land was green in midsummer, but for the gray outcrops of crumbling stone that crowned the peaks. The force of the wind cresting the rise was so strong that David could have leaned forward into it and been held as by an invisible hand. The wind swirled as it hit the rocks, wrapped itself around him, warm as a fur-lined cloak and surprisingly gentle for a wind that carved stones with its touch. It set the skirts of his unbuttoned coat flapping, pennants in the wind. Home, he thought. This was the land he knew, the world of fields and mountains that he’d spent hours watching from atop the high tower of the castle. So much greener, so much more alive than any of the land he’d passed in Arien. He bent and picked up a bit of stone from the path, dropped it into his pocket. He found that he was grinning. He wasn’t quite dancing with delight, but that would be the next logical step. From the earth beneath him and the air above came a sound like distant music. It swelled with the rush of the wind, a chorus of thousands singing on the same note. The air quivered around him, as if it were about to change from air to light. David stood one step within the border of Shandor, caught by the wind and song that spun up from the soles of his boots to the top of his head. He felt that the tips of his hair must be dancing to the sound. He wanted to stand there forever, and never be released. A map of Shandor, showing the townlands to the south and the mountainous lands of the K'shay tanna to the north. He camped at the foot of the pass that night, and traveled the next day through the foothills, west toward the castle. The path widened into a road, or rather into two wheel-ruts, overgrown by long grass. David did not remember that road being so neglected. He met no other travelers all day, although there were towns nearby, tucked back into the hills. The next day, when the morning sun had just cleared the bank of clouds in the east, David caught his first glimpse of the high tower. It was the only part of the castle visible above the surrounding hills, and even it was obscured until the sudden glint of sun made its pale grey stone flare brilliant white. David’s room had been in that tower, with a window that looked south, over the courtyard; the adjacent room, with a view of the mountains, had been Corin’s during the winter, when he came to stay at the castle. David strained his eyes to see the flag atop the high tower. He had always been able to pick it out, even at a distance; golden Shandorian Star bright against the blue sky. He squinted, but saw nothing. He rode down through a gap between two hills, and the river gorge opened suddenly before him; the dirt road became a graceful span of stone arching across the river that eddied far below. The horse’s hooves clattered as he crossed. The road curved to the right and followed the river around a bend, bringing him into sight of the castle on its rocky island. The river Caeroshkaerd—Heart’s Blood—came flying down from the mountains to break in sprays of white foam about the roots of the castle; it split into two branches, two arms wrapped about the rock. The branches flowed separately in deep gorges before joining again into a single stream and winding off through the low hills, to empty into the Lake. David remembered the song of the river, deep and roaring, as it rushed along at the castle’s feet. It could be heard all through the castle, even in his tower room; he had fallen asleep listening to the river, trying to catch the words that he knew must be hidden somewhere in that roaring song. David listened once again, and found that nine years had not improved his ears. He still could hear no words. The river foamed over its stony bed as wildly as ever, though, and its cool, misty breath rose up to touch his face as he dismounted before the gate-bridge. At his feet, tiny white starflowers wove through the long grass, trailing down into the gorge to cling to the spray-soaked rocks. In winter, spectacular formations of ice coated the sides of the ravine, and in summer, flowering vines. 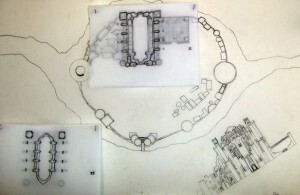 Blueprints of the Castle of Shandor on its island, showing the various floors of the Great Hall and other buildings. A front view of the Great Hall is also included. He looked up. The gate towers and the west wall of the castle loomed dark grey in the shadow cast by the morning sun. The stone of the island and the walls of the castle were almost seamlessly joined, so that the castle seemed a natural outgrowth of its rocky foundation. The passage before him might have been a cave entrance rather than a fortified gate. The doors stood open and the portcullis was raised; no guards at the entrance, and no people visible in the courtyard beyond. David blinked, trying to bring his eyes into focus, to see what had to be there. No people? His heart beat in his ears as he led his horse quickly over the bridge and through the dark archway, out into the sunlit courtyard. The flagstones were overrun with green; long grass grew between the cracks, and clumps of tangled bushes sprouted in the pathways that had once been well-packed earth. Stick-weed and brambles covered the kitchen garden. A family of quail, startled, squawked and scattered. David left his horse to fend for itself, and ran across the courtyard-turned-meadow. When he had been very small the space within the castle walls had been an entire world, and the open courtyard between his parents’ apartments and the gates had been a nearly uncrossable expanse of grass, earth and stone. Even now, with longer legs, the Great Hall and the entrance to the high tower seemed miles away. 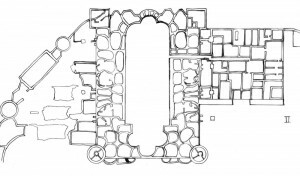 The Great Hall alone was larger than most Arienish castles. With a tower at each corner, elegant buttresses, and a roof whose highest point reached twice as tall as the surrounding walls, it could have stood alone, magnificent in its own right—and perhaps it once had. 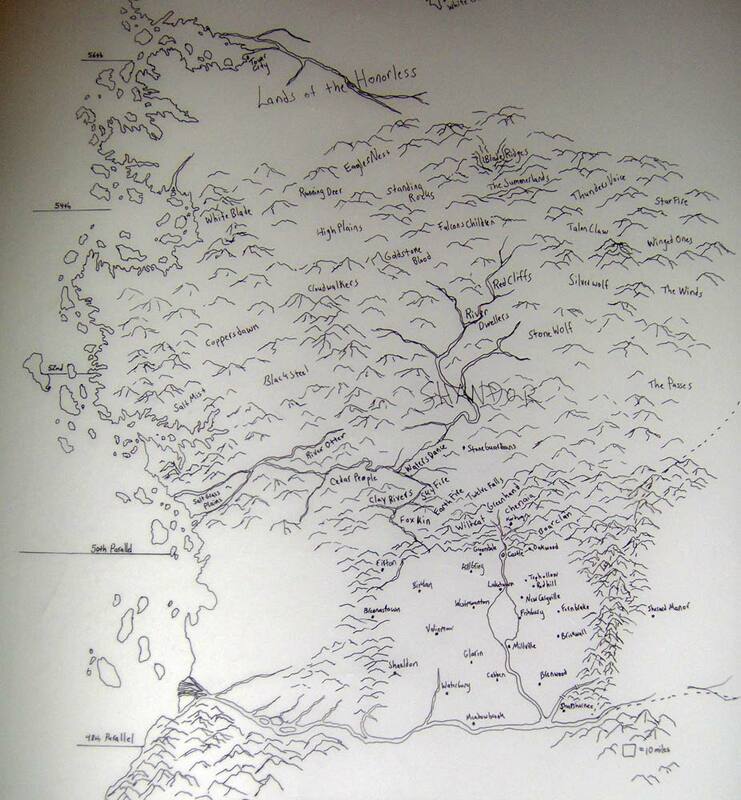 When the ancestors of the townspeople had arrived in Shandor, fleeing across the eastern mountains from the war-troubled land that would later become Arien, they found a green, fertile country; stubborn natives; and on an island in the middle of a singing river, the ruins of a hall and two white towers. One tower was partly crumbled, one pierced the clouds with its impossible height; the Great Hall was roofless then, colored window glass shattered in a mosaic on its lichen-crusted floor. The townspeople settled in their new land, intermarried with the K’shay tanna, and built on the ruins left by the Ancients. The gates and outer walls, the gate-towers, the kitchens and most of the living quarters were of that newer construction—a mere five centuries old, compared to the unguessable age of the Hall and the white towers. David raced up the spiraling stairs of the high tower, taking the steps two at a time. He ran past closed doors to the inside and open windows to the outside; up two hundred and eight steps to the door of his room. It was standing open. Had he left it that way? He felt suddenly that he had never gone away, that he had just run upstairs to grab his belt knife and satchel. Pausing outside the door, he put his hand to the doorframe, at about shoulder height. He had accidentally cut a notch in the wood while swinging his knife at imaginary enemies. Where had it gone? He looked from one side of the doorframe to the other, before he remembered, and lowered his hand to about waist level. The thin white curtain that had covered his window hung by one corner, flapping in the summer breeze. Winter winds, snow, and rain must have blown in, because the wooden clothes press beneath the window had warped and discolored. His bed was water-damaged, too, and the blankets were shredded and dirtied by rodents. The ashes from the fireplace were scattered on the floor along with dust, leaves and dead insects. What had he expected? That time would leave his room untouched? That another boy would move in and store birds’ nests under the bed? 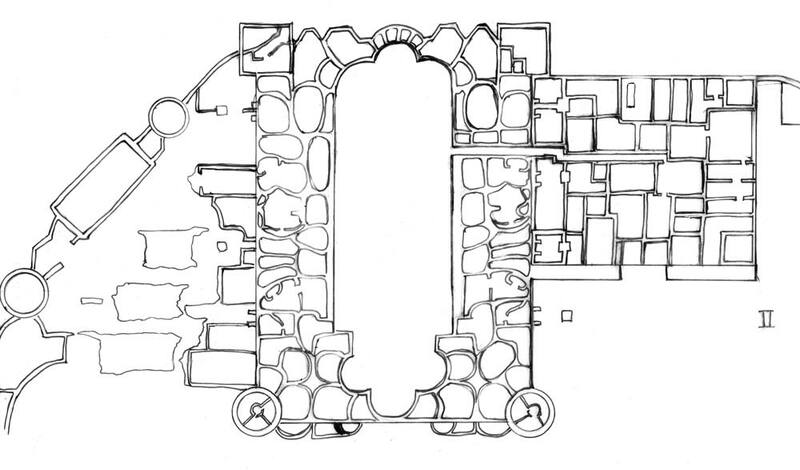 A map of the second floor of the Castle of Shandor, showing the Great Hall and its environs, including the kitchen wing. Out into the courtyard, where the sun was still warm, the breeze still mild. He pulled grass from between the stones, absently kicked over an anthill, and found himself, eventually, at the double doors of the Great Hall. Of course. All paths lead to this place. As tall as three men, built of heavy oak, the doors were perfectly balanced and moved to the thrust of a child’s hand. He swung them open and stepped inside, into a silence deeper than the silence of the empty courtyard. Rows of slender columns reached upward to the vaulted ceiling, dim and distant even with the midday sun streaming through the high stained-glass windows. Dust-flecked rays of purple, blue, green and red drifted down to settle on the flagstones. A slight breeze moved within the Hall like a soft breath; the feel of the air spoke of high, open spaces, emptiness and silence above and around. David’s footsteps echoed to the ceiling as he slowly walked the length of the Hall. At the furthest end, in the golden light of the Star window, he paused and held his hands out so that they shone gold. He had showed this to Corin a very long time ago, the changing colors of the light, blue fingers, gold face, red feet. He looked up, through the window into the sun, and let the light dazzle his eyes. Some things never changed. The expanse of the Great Hall still made him feel small. No difference, here, between thirteen and twenty-two; he would never grow tall enough to touch this ceiling. He lay on his back, on the sun-warmed stone, and watched motes of dust dancing in the golden light. When he stirred the air with his hand they danced faster, swirling like wind-driven rain. Rain never fell, here. That was why water had to be brought, on the high days, and poured on the stones for cleansing. David wondered how long the hall had gone without that blessing. This entry was posted in The Shandor Cycle and tagged maps, snippets. Bookmark the permalink. …but… WHAT HAPPENED?! What were David’s dreams about? Why was he there? Why wasn’t anyone else there?! AAARRRGGGHHHHHH!!!! I want to know!! !